Most precious metals advanced Thursday, Jan. 3. Platinum was the exception, slipping 0.6%. Once again, silver and gold posted fresh multi-month high settlements — more than five months for silver and nearly seven months for gold. Gold for February delivery added $10.70, or 0.8%, to close at $1,294.80 an ounce on the Comex division of the New York Mercantile Exchange. The settlement was the highest since June 14 when gold ended at $1,308.30 an ounce. "Obviously, the concerning news from Apple sales in China has created an additional wave of equity market selling, and that in turn has continued to pump money towards gold," analysts at Zaner Precious Metals wrote in a daily report, according to MarketWatch. 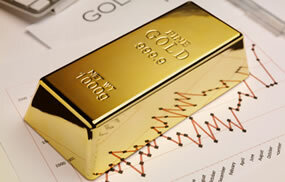 Gold futures ranged from a low of $1,286.40 to a high of $1,296.90. They rose 0.2% on Wednesday and dipped 0.1% on Monday. Ending higher for a seventh straight session, silver for March delivery rose 14.8 cents, or 1%, to end at $15.797 an ounce. The settlement was the highest since the precious metal ended at $15.812 an ounce on July 16. Silver futures traded between $15.55 and $15.82. They advanced 0.7% on Wednesday and rose 0.7% on Monday. April platinum declined $4.70 to $799.30 an ounce, ranging from $795.30 to $804. Palladium for March delivery added $1.50, or 0.1%, to $1,200.30 an ounce, trading between $1,192.90 and $1,204. On Dec. 19, the metal ended at a record $1,201.30 an ounce. Gold added $7.55, or 0.6%, to $1,290.45 an ounce. Silver rose 9.5 cents, or 0.6%, to $15.535 an ounce.